Meet the cookware pieces you shouldn't be without. Get the most out of your AGA with our range of AGA Essentials. 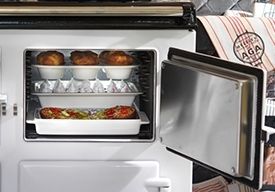 Our roasting tins and baking trays are ideal for roasting meat, vegetables and for tray bakes and are designed to fit directly onto the AGA oven runners. Plus choose from a range of AGA Bake-O-Glide liners that are non-stick and dishwasher safe for easy cleaning and can be used again and again.